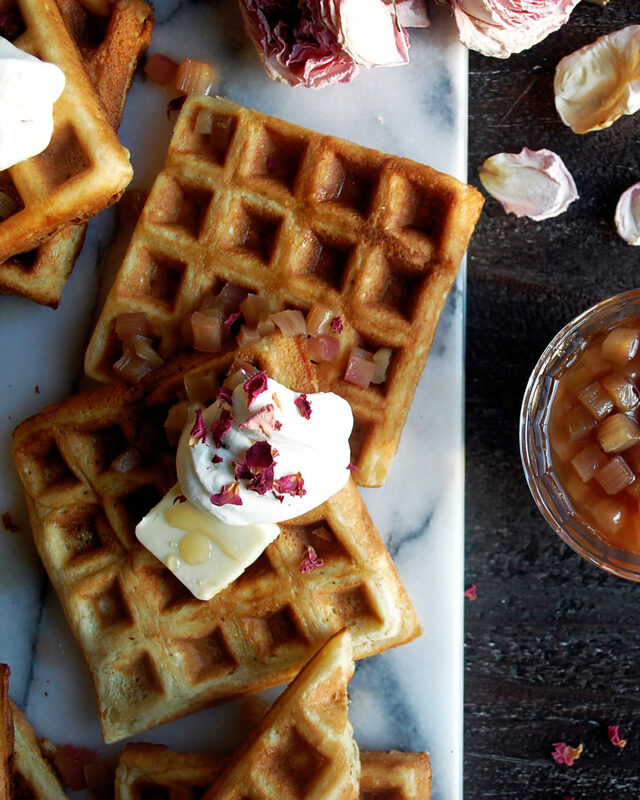 Let’s talk waffles and rhubarb. Waffles are such a classic breakfast item. 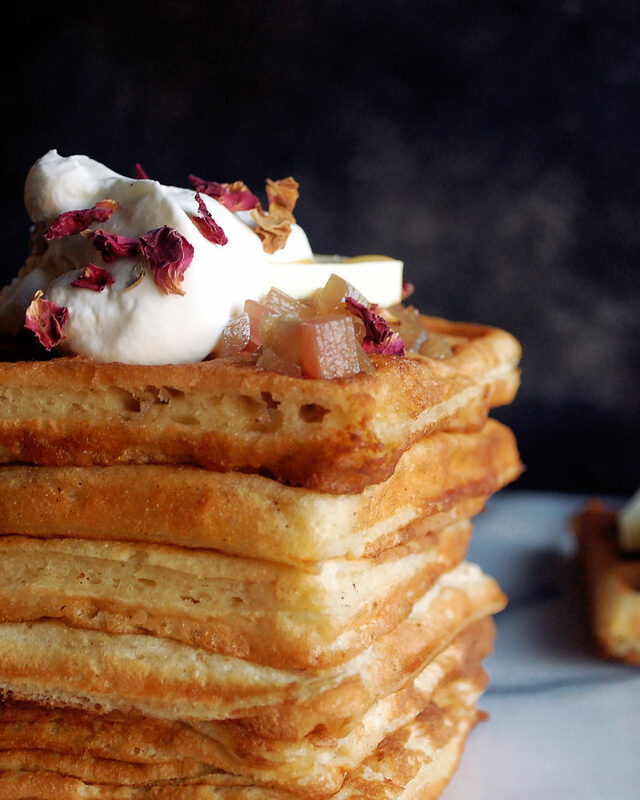 They’re delicious with all sorts of accompaniments and toppings, but I actually love them the most when they’re done very simply, with just a few other ingredients so the pure taste of the waffle can come through. 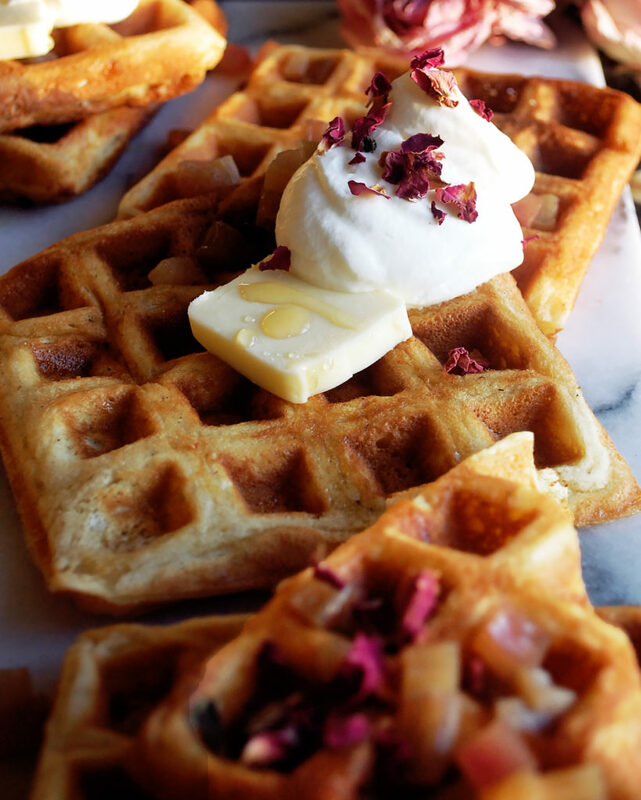 I make this waffle batter just how I learned to do in culinary school. Wet ingredients get incorporated into dry ingredients and then egg whites get whipped and folded in. By folding in whipped egg whites, the batter is extremely light and airy. It makes for a wonderfully soft, fluffy waffle. I add lots of vanilla to the batter so you can actually taste it in the waffles. I like to use vanilla as an ingredient, with a substantial amount instead of just a drop that gets masked by everything else. 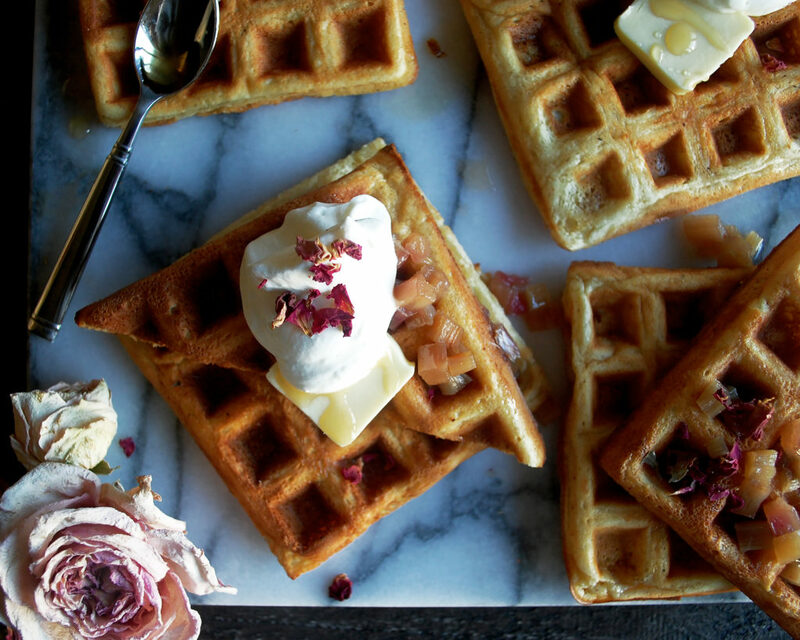 So, the batter gets made and cooked just like any other waffle…in a waffle iron. I usually make a little extra batter just so you can test a few first. It may take some trial and error to get the waffle iron at the perfect temperature or to pour the perfect amount of batter into it. 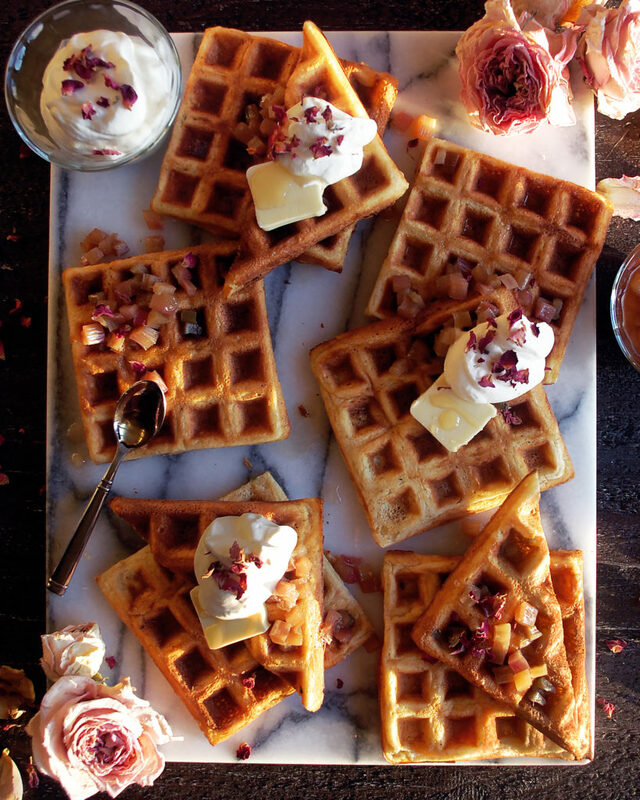 Play around with it, and definitely munch on the “trial” waffles. You’ll also want to make sure to have a spray form of oil to heavily spray the waffle iron, coating every little nook and cranny so the batter doesn’t stick. Rhubarb is a perennial plant that’s in season beginning in the spring and running through early summer (typically April-June). It is technically a vegetable, but is commonly used in both fruit and vegetable applications. The physical shape of the rhubarb includes a long stalk, ranging in color from deep red to pink with streaks of green throughout, and large green leaves on top. Always discard the leaves. The stalk is what you want to work with. Rhubarb is full of antioxidants, vitamins, and minerals. It’s a very hearty plant that is bitter in taste, yet has an intriguing sweetness as well. 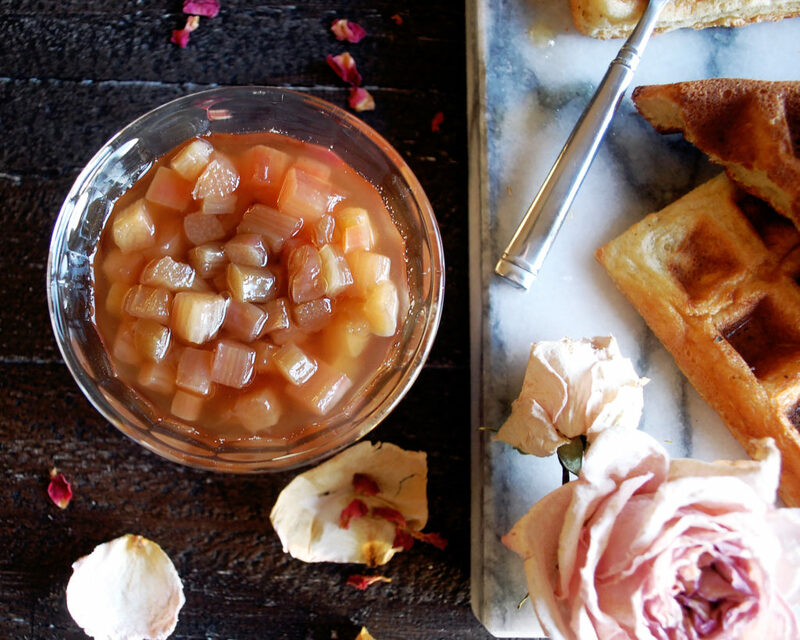 When you cook rhubarb, it gets sweeter and sweeter. What you’ll want to do is remove the leaves, trim the ends, and then cut the stalk into smaller pieces, depending on what you’re using it for. Some common dishes with rhubarb include pies, cobblers, tarts, breads, sauces, jams, or a braised savory side dish. Just like any ingredient, the possibilities are endless. You can find rhubarb at local farmer’s markets and some grocery stores (like Whole Foods) when it’s in season. 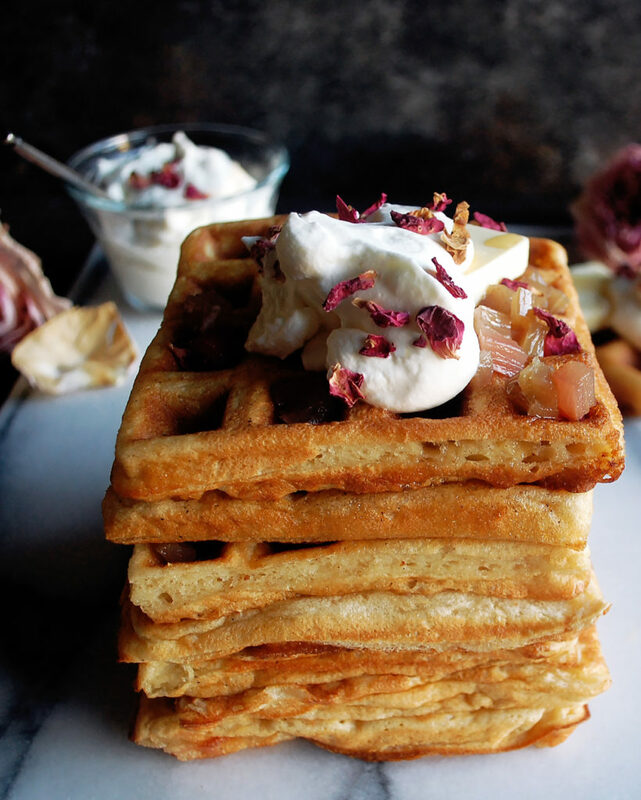 For these waffles, I simply dice the rhubarb into small pieces and poach it in a maple poaching liquid. It takes no time at all, and I just love the interesting flavor it adds to the waffles. I keep the rest of the dish really simple with some “soft” whipped cream. Basically, I begin to whip cream as usual, but stop whipping before it reaches stiff peaks. The cream tastes so wonderful when made like this and has the most beautiful texture. And as for any good waffle, you’ll need a small slice of butter and some maple syrup to drizzle on top (I reduce the poaching liquid down and use that as the syrup). Enjoy! Sift the flour, baking powder, baking soda, salt, and sugar together into a mixing bowl. I like to weigh the ingredients out into one bowl and then sift into another. In a separate bowl, whisk the egg yolks with the buttermilk. Create a well in the dry ingredients and pour in the wet ingredients, whisking until the batter is about half incorporated. Drizzle in the melted butter and continue to whisk until the batter is smooth. Beat the egg whites separately until they form medium-stiff peaks. Gently fold the whites into the batter. The goal is a light, aerated batter. Heat a waffle iron (I set mine at level 5, but depending on your iron you will have to play with the settings to find the perfect heat). Spray both the top and bottom with a generous amount of oil (I use a canola oil spray from Whole Foods). Ladle the waffle batter into the iron, enough to create one, even layer. Close the iron and cook until golden brown, just a few minutes. Use a fork to pry the waffles out. Repeat with the rest of the batter. Trim the waffles so they are clean squares. Right before serving, flash the waffles in a 350F oven to heat through. Combine the maple syrup, water, cloves, and star anise in a small saucepan. Bring to a simmer. Add the diced rhubarb and poach over low heat for about 5-6 minutes until the rhubarb is tender. Use a slotted spoon to transfer the rhubarb to a plate. Continue to reduce the syrup mixture over medium-low heat until most of the water has evaporated and the syrup has thickened. Add the rhubarb back in. Serve warm. Whisk the cream in a stand mixer until it just begins to form slight soft peaks. Add the sugar and vanilla extract. Whisk to incorporate. Stop whisking when the whipped cream is sturdy enough to hold its shape, but still very soft and smooth (before stiff peaks). 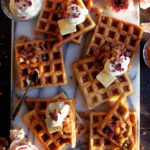 Serve the buttermilk waffles with a spoonful of maple poached rhubarb, a slice of butter, and a dollop of the whipped cream. Drizzle the syrup over top. Garnish with dried rose petals, if you’d like. I appreciate this SO much Meghan!! Seriously, thank you!